There are a few things to consider when ordering several pairs of safety footwear for your workforce. How should you go about choosing your supplier? It’s hard to know what to look out for, especially when imported safety boots often appear to be the most cost effective option. Sure, pricing is important but here’re a few other things to consider when choosing a supplier: Quality This is one of the most important things to consider. Ask yourself if you are going to be able to get the quality that you will be paying for. If you doubt this, perhaps it is not the supplier for you. A good supplier will have products that are certified by various safety and manufacturing bodies. They should also be able to supply you with proper documentation to prove this. What you pay for is what you get Generally a R150.00 shoe will never be as durable as a R350.00 shoe. Whilst you may be paying less for a cheaper pair of safety shoes, this may amount to further expenditure when you need to purchase another pair because the others just didn’t last. Another true cost is that of failed safety, something that no one in industry can afford due to knock-on side effects like injury, disability, and even death. Location, location, location! Getting efficient customer service from someone who lives in another country and in a different time zone is a real challenge that you don’t want to encounter. Time is also an important resource should something get rejected or you need an extra pair or two, you need a quick turn around time. Plus, we share the sentiment that “local is lekker!” Why not support suppliers close to you by buying local to sustain the livelihoods of those in the South African manufacturing market? Customer service This variable is one that is often a deciding factor when choosing a supplier. Ask yourself if the service level that you receive is efficient and effective. A good supplier should have well-trained staff members who can make the process of buying a positive one. 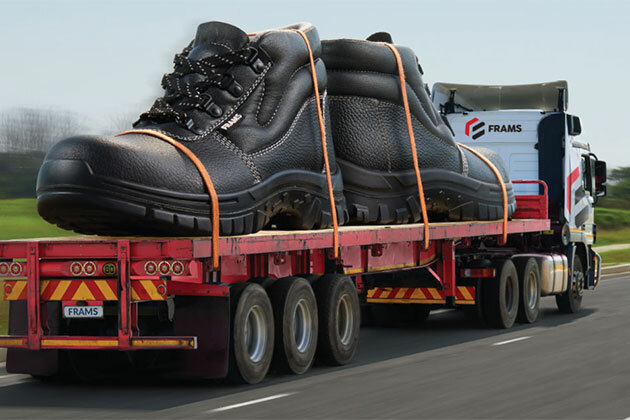 Frams are proud manufacturers and suppliers of affordable safety footwear that you can trust. For more information on our extensive range and how they can offer you safety in your working environment, visit our website www.frams.co.za.